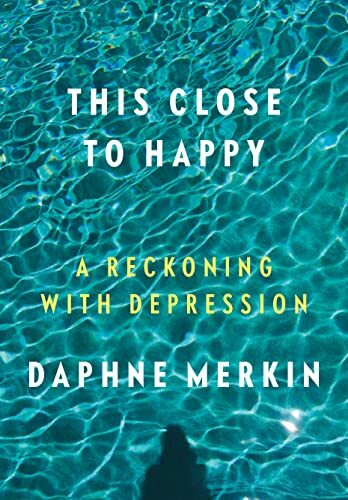 In her memoir This Close to Happy, Daphne Merkin further develops on her several earlier essays describing the experience of her illness: the depression, the hospitalizations, the suicidal thoughts, and lasting, tearful moods of unhappiness and apathy. For those familiar with this earlier writing, the book was slow in coming and anxiously awaited, its long delay suggestive of further trouble, perhaps another painful interruption to Merkin's difficult life. That wait raised the stakes: this had to be good. And it is, an absorbing, candid, and wry account, taking us from Merkin's privileged if demanding upper East Side beginnings as little, rich, Orthodox Jewish, girl, through her employment as an editor/ writer/journalist in the elite publishing world of New York, and her regular stays in a variety of New York's closed psychiatric institutions, to her summer rentals in the Hamptons. Merkin is a New Yorker through and through, and the setting barely strays from that city and its outer reaches, except a brief non-stop El Al flight to Jerusalem, where her mother keeps a flat. Her world is these two cities and little else. Her indomitable mother stands at the center of Merkin's constellation, and is assigned the part of first cause of all that follows: the childhood tears and distresses, the later post-partum and other depressions, the years of psychotropic drugs and agreeable shrinks (who apparently affirm Merkin's conviction that her strange, German mother, together with an equally strange nanny, explain the daughter's subsequent psychic frailties). "…I was the child my mother had designated to work out her unspoken conflicts with the life she had chosen." Sounding redolent of the Freudian couch, and dated in today's post-psychoanalytic times, this is a theme running through the book." " You blighted my life. I didn't have a chance." I tell my mother this… crazed by some pain eating me up…" In fairness to its author, on one reading the work is simply an attempt to understand and explain the mother, and only incidentally an account of the collateral psychic damage she scattered about her. However, these causal speculations are not the strongest part of the book. Of more interest are observations springing from Merkin's privileged epistemic position as the suffering subject of her tale (her semantic authority, in the words of standpoint theorists and mental health consumer rhetoric). First, and familiar from her earlier writing, are her descriptions of the moods themselves, the way they cling, pervade and swell. Second, Merkin carefully documents her in-patient stays, and the accompanying feelings - at once bored, restless and alienated, and at the same time comforted and protected by these spaces of retreat and seclusion. Her sharp eye takes in every detail of the social world of the asylum: the way the gaiety and hopefulness of the young patients with anorexia contrasts with the mien of glum depressives like herself; the indifference of the underpaid staff; and the attempts of the medicated inmates to while away this time out of time, using ping pong, numbing television and brief moments in the fresh air. "Managed" by medication, today's inmates no longer exhibit the florid disorder spicing up life in the asylums of old, and Merkin depicts a setting of boredom and unrelieved sameness predominate. Another matter, that the author raises discursively, and also succeeds in showing throughout her narrative, is the paradoxical nature of depression itself, as a disorder in which self-awareness and coherent thought are retained to the point of permitting, even fostering, pretense and dissimulation. Depressive states notoriously blend into more normal sadness, self-disparagement and despair; depressive disorder is not a categorical entity, classifiers explain in pointing to this feature, but one that is continuous with normal responses. Moreover depressions are episodic: they wax and wane, with barely perceptible changes alerting observers - and their sufferers -- to improvements and worsenings. Because it is possible, although sometimes only with great effort, to pretend, passing oneself off as normal and "playing along" in a role entirely at odds with what lies beneath, subjects of depression are endlessly challenged by observers over their place in this fuzzy borderland between debilitating disorder and normal responses. (How disabled, really, was Daphne Merkin, we find ourselves asking? Could she have pulled herself together? Thought about someone other than herself for a change?) The remarkable value of this memoir lies in the fact that with her intact self-awareness, and sharp eye for social norms, Merkin challenges herself along these very lines. To this day, she concedes "I can't figure out if [depression] qualifies as a full-fledged disease, like cancer." Perhaps it is a problem of flawed cognition: depressives "expect too much of life when they're not feeling depressed, have too exalted an idea of what the standard is," she speculates. A final aspect, lifting This Close to Happy, above almost all of the many other depression memoirs I've read, lies with Merkin's handling of her recurrent suicidal thoughts. As seemingly neutral speculations about method (the knife, the pills, the jump from a high place); as ruminations about suicide notes, and the effects on those who are left; as philosophical meanderings on the meaninglessness of continuing; as the raw, urgent impulse to just do it - these thoughts hover and swoop throughout her story. We have all known suicidal thoughts; some or all of these speculations and impulses are the experience of every reflective person from adolescence on. Like "normal sadness," "normal suicidality" seems to be part of the human condition. And here again we inhabit the fuzzy borderland where normal responses merge with abnormal, and philosophical speculations give way to dangerous obsessions (or impulsive action). It is a tribute to Merkin's writerly skill and candor that we seem to be able to discern a difference, here. Insistent and malevolent, suicidal thoughts come to appear inherent to our author's psyche. As such, they alarm us. Sadly, they seem to add to our sense that this is indeed a disease, a piece of neural wiring that has gone amiss, and that Merkin's brief, final moments of hope that she has permanently outwitted her depression may be-- as she well knows - illusory.